Home › FAQ › Do You Need to Pay a Fee With Each Common Application You Submit? Many colleges now let students complete and submit their applications online, but if you apply to schools that use the common application, you’ll find that you need to pay a fee for each common application you submit. Each school has the right to set its own fee, and fees can range from $25 to more than $60 for each college. You should learn more about the common application and the information you need before you begin using the system and applying to schools. This application lets students apply to more than 400 colleges across the country using one account. When you apply to college, you typically fill out an application that asks you about your past and questions that relate to your future. You will find all the same questions on the common application. The application will ask you some simple background questions about where you went to high school, your grades in high school, if you attended college in the past and any extracurricular activities you did or hobbies you have. In addition to knowing that you need to pay a fee for each common application you submit, you should also know that each college can require that you submit a separate customized section relating to that specific school. 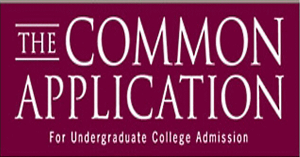 You need some simple and basic information when you complete the common application. According to the Common Application website, you must have a copy of your high school transcript, a list of all activities you did in school and out of school, the scores you received on standardized tests and information relating to your parents. The application will need to know the names and contact information of your parents and where your parents work. Before you can apply to a single school using the common application, you must create an account with the website. Creating that account is fairly easy. All you need is an email address that you can check regularly. You register that email address with the website and select a password that you can easily remember. The website will send you an email to confirm the address is valid. Once you click on the link in your email, you can begin filling out the necessary information and start applying to colleges. Though the common application lets you apply to any school that interests you, you will need to pay a fee for each common application you submit. You can use a debit card or a credit card on the website to pay those fees. Though some schools may charge as much as $75 or more, other schools do not charge a fee. You should check the details to each college to determine if it charges an application fee and the size of that fee. Some schools also offer fee waivers for those who cannot afford the price, but you will need to contact the college to obtain a waiver. The common application is a website that lets students apply to multiple colleges with the information they attach to their accounts. This lets you apply to college faster than you anticipated. Keep in mind though that you will need to pay a fee for each common application you submit on that website.